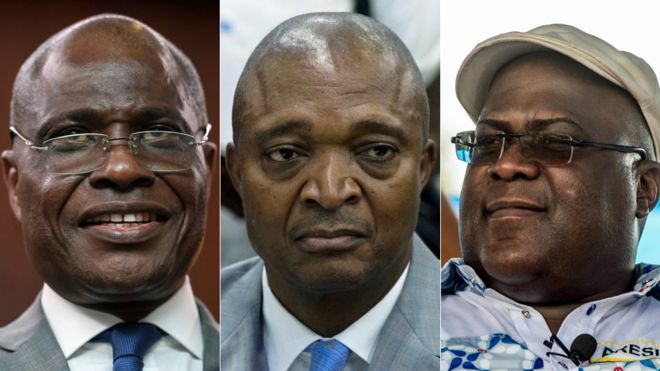 Opposition candidates Martin Fayulu (L) and Felix Tshisekedi (R) face Emmanuel Shadary (C), the former interior minister. KINSHASHA – Polls have opened in Africa’s second largest country in an election delayed for more than two years. Close to 40m people are eligible to vote in the Democratic Republic of Congo, where President Joseph Kabila – in power since 2001 – is standing down. But the run-up has been hit by violence and controversy over the decision to exclude almost 1.3m people from voting. On Saturday, rival candidates also failed to agree on a statement aimed at reducing tension before the poll. Voting began at 05:00 and ends at 17:00 according to the country’s electoral commision. What’s the context for these elections? If everything passes without incident, this will be the first peaceful transition in DR Congo since it gained independence from Belgium in 1960. The current president, Joseph Kabila, took over from his assassinated father Laurent in 2001, but he is barred from running for another term under the constitution. He was supposed to step down two years ago, but the election was postponed after the electoral commission said it needed more time to register voters. The decision triggered violent clashes, as the opposition accused Joseph Kabila of trying to cling on to power. Then last week, the election was delayed again, for seven days, because of problems deploying voting materials to polling sites. This all came after thousands of electronic voting machines – being used for the first time – were destroyed in a fire in the capital, Kinshasa.